Michael, DG0OPK has been doing a lot of experimenting with running Gqrx on various ARM boards. In this video below, he shows gqrx running on the latest Odroid C2 from Hardkernel, which has a 64 bit, 2 GHz quad-core processor. Only a few weeks have passed since the gqrx 2.4 release, there has been enough development going on to justify a new release. This release includes a few new features as well as important bug-fixes. Read out signal time and frequency on the waterfall (disabled on OS X). Save waterfall to graphics file. Allow user settable waterfall time span (up to 24 hours). Cmake option to build using gr-audio backend (Andrea Merello). FM stereo (revert to pre-2.4 behavior). Mode selector not updated when selecting a WFM OIRT bookmark. Show correct filter preset when filter LO/HI corresponds to one. Prevent RDS panel from growing by making it scrollable. Use correct audio backend on OS X (app bundle only). Button layouts (mostly on Mac OS X). As you may have noticed, new development for this released has been mostly on the waterfall. The adjustable time span allows us capture spectrum data over longer periods and the save functionality provides a convenient way to save the captured data to a graphics file. The image below shows an example of such capture. 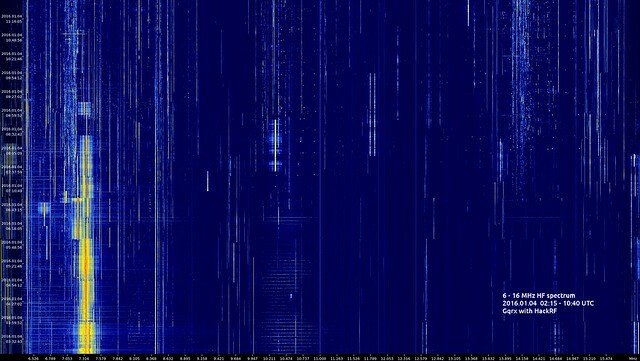 It is a ~20 minute capture of the transponder downlink from the FO-29 amateur radio satellite. Another example for how this feature can be used is spectrum surveillance. The image below shows the 6–16 MHz HF spectrum over an 8 hour time period. It was captured using a HackRF device. As written above, the time span can be up to 24 hours, however, this is only an arbitrary limit and we can increase it should the need arise. Looking forward to seeing how people will use this feature. Updated packages are already available in our new PPA. Instructions for new users are available on the Ubuntu Install page. As always, there is an up to date Gqrx package in Macports shortly after the release. There is now also an app bundle available from GitHub or SourceForge. The bundle was built on Mac OS X El Capitan and contains all required third part libraries, as well as the command line utilities that come with the Airspy, RTL-SDR, Hackrf and Bladerf driver libraries. See the included README for details. The source code can be downloaded from GitHub or SourceForge. Starting with this release, gqrx can also be compiled using cmake, see the README file for details. Building with qmake is still available and will not disappear any time soon, so feel free to use either method. One year after the 2.3.2 release, Gqrx 2.4 is now available for download. This release includes both new features, important bug-fixes as well as improvements of existing functionality. 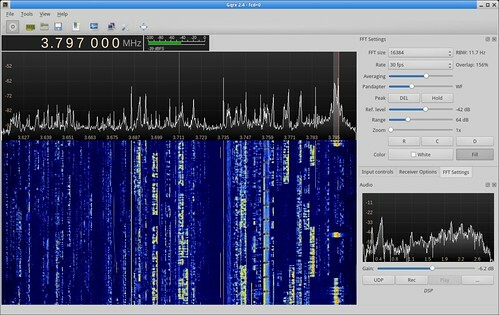 FM RDS decoder using gr-rds. Frequency tooltips on the FFT area (disabled on Mac). Filter shape selector (soft, normal, sharp). Slider to aid zooming on the frequency and dB axes. RFSpace Cloud-IQ support (still work in progress). OIRT stereo decoder (Daniil Cherednik). Prevent crash due to device errors while starting the application. Use hardware frequency in IQ file names. FFT averaging (it can now be disabled). “Could not resolve pattern10600” error messages in the terminal. Antenna selection error with USRP B210 (Ethan Trewhitt). LNB LO value not updated in I/O config dialog. Initial gain of rtlsdr devices is no longer 0 dB. DSP freeze when setting FM de-emphasis time constant to 0. Use correct main category in desktop entry file. Support up to 1M point FFT. Right click on frequency digit to clear digits. Robustness against malformed remote control commands. Starting with this release, we have a new PPA that contains only Gqrx binaries and uses MyriadRF PPAs for GNU Radio and SDR driver packages. I realize this is inconvenient for existing PPA users; however, this offloads some of the packaging work from me and will ensure more up to date GNU Radio packages for Ubuntu users in the future. Please make sure you have the previous PPA disabled and old, obsolete packages removed before using the new PPA as instructed on the Ubuntu Install page. Feel free to contact us if you need help with the PPA transition. As always, there is an up to date Gqrx package in Macports. There is now also an app bundle available from GitHub or SourceForge. 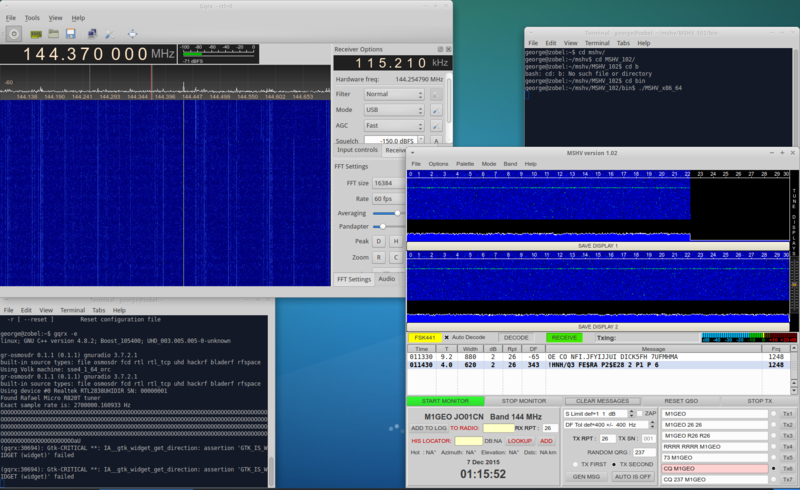 The bundle was built on Mac OS X El Capitan and contains all required third part libraries, as well as the command line utilities that come with the Airspy, RTL-SDR, Hackrf and Bladerf driver libraries. See the included README for details. Meteor scatter, or meteor burst communications, is a challenging field within amateur radio communication, where the operators use the ionized trails of meteors for reflection of radio waves. George Smart, M1GEO, has posted a very nice write-up on his website describing the setup that he uses for meteor scatter reception. The setup uses an RTL-SDR dongle with Gqrx as receiver, and WSJT or MSHV for decoding. Meteor Scatter reception setup by M1GEO. Image credit: M1GEO. 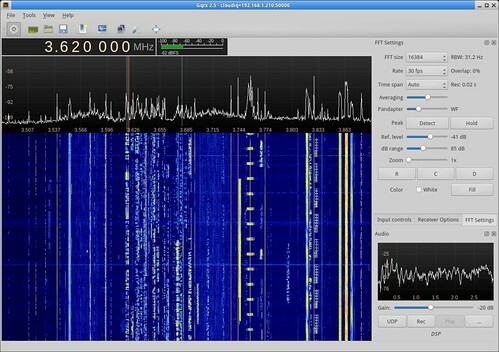 Check out Meteor Scatter Reception on RTL-SDR. 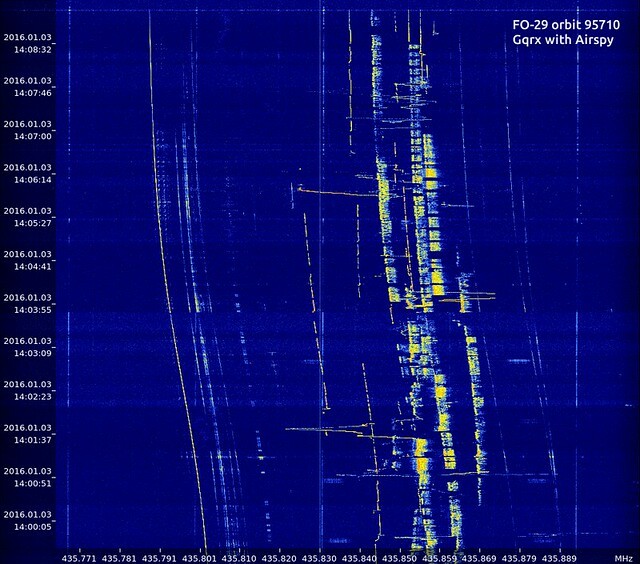 Are you interested in receiving and decoding telemetry from amateur radio satellites? Then check out this excellent article by Jan PE0SAT called Unix TLM (Telemetry) decoding, where Jan gives a description of his setup. 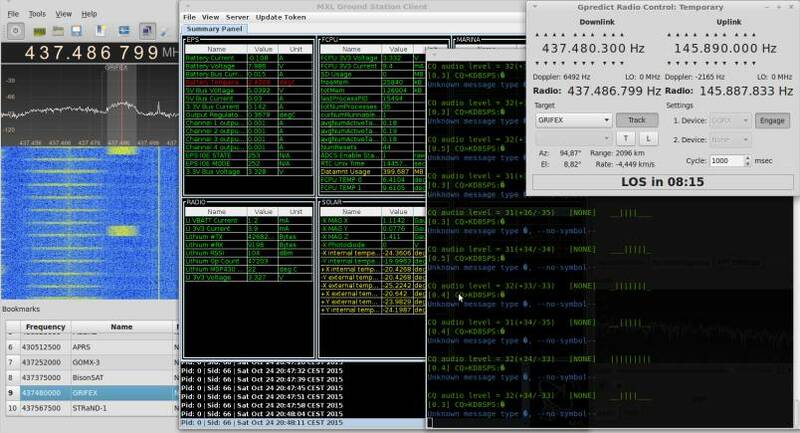 In his Linux setup, Jan uses Gqrx as SDR front-end and Gpredict to track the satellites. As we wrote earlier, Gqrx has a Hamlib-compatible TCP interface so that we can use Gpredict to adjust the receiver frequency with Doppler corrections. PE0SAT Linux telemetry receiver setup. Image credit: PE0SAT. Jan also takes advantage of the Audio/UDP interface in Gqrx as well as the audio routing capabilities of modern Linux desktops to route the demodulated audio from Gqrx to external decoder applications. All in all, this is a very nice setup that demonstrates well how Gqrx can be hooked up with external applications to get new functionality. Written by Robert Lainé (robert.laine at sailcut.com), this document provides a practical introduction to getting started with gqrx.